The people who spout ‘diversity is our strength’ have cast a mind-dulling net of intellectual conformity across our nation. Thought police don’t just troll the halls of academe; they have infiltrated society so deeply that violence from those offended by supposedly hurtful thoughts or words is sanctioned by the highest levels of government and popular institutions. Trump supporters can find themselves beaten up. Municipal police in San Jose CA just watched and stood idly by as Trump rally attendees were assaulted. Since Trump is obviously a racist, then so are his followers. Opposition to racism is a higher good than civility or respect for others. Hillary Clinton has called for shutting down Breitbart News, while Senator Barbara Boxer investigates and threatens companies that challenge climate change orthodoxy. Christians are compelled to comply with diktats that violate the fundamentals of their faith and the free government foundations of our republic. The force behind all of this is a secular Social Justice Religion centered on phony climate change that Leftist apostles defend and enforce with righteous indignation. Conformity in thought and deeds are essential to their future perfect world in social justice Utopia. Since Christianity and Constitutional principles stand athwart their goals, the destruction of both is moral and good. 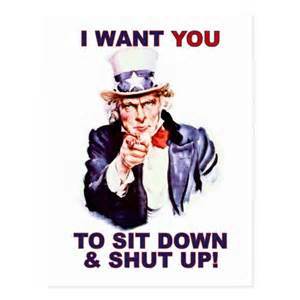 Most Americans, those who refuse to drink the Kool-Aid, are expected to shut up and sit down. Through endless repetition we are informed that the greater good of society is served through our non-resistance and passive obedience to Left-government. Nonsense. Government-enforced Non-Resistance and Passive Obedience over an unwilling society has, in the past, led to revolution. For almost thirty years, from 1660 to 1688, Stuart Kings and their Anglican Church enforced the divine right of kings to rule, and treated dissent and disobedience both unlawful and sinful. In 1661 parliament imposed on all clergy and office-holders a non-resistance oath – ‘that it is not lawful upon any pretense whatsoever to take arms against the king.’ Through divine right, kings should rule and command in their several dominions all persons of what rank or estate soever, whether ecclesiastical or civil. Non-conformists, non-members of the Anglican Church were prohibited from holding any public office. The Oxford Decrees of July 21st 1683 prohibited ‘pernicious books and damnable doctrines, destructive to the sacred persons of princes, their state, and government, and all of human society’. These put the premier teaching institution of the country and the intellectual center of the church strongly against all notions of popular resistance and firmly in favor of passive obedience in clear terms. Reversal of these doctrines required revolution, the Glorious Revolution of 1688. In the 1689 indictment of King James II, he was charged with acting contrary to his oath, which entrusted in him a limited power to govern by the laws of the land, to use that power for the good and benefit of the people, for the preservation of their rights and liberties. Instead, it read, he conceived a wicked design to erect and uphold in himself an unlimited and tyrannical power to rule according to his will. In modern times, the Left has inverted the sovereign/servant relationship. Through a warped system of indoctrination beginning in their earliest school days, a people founded in liberty are taught non-resistance and passive obedience to tyranny. Yet, history shows the servant cannot forever demand non-resistance and passive obedience from the sovereign people. Resistance is growing nationwide as God-given reason informs us that government is made for man, not man for government. While violence against tyranny is our natural right, so are less than violent means. We must use them to restore free government. Huyler, J. (1995). Locke in America. Lawrence, KS: University Press of Kansas. Kenyon, J. (1990). Revolution Principles The Politics of Party 1689-1720. Cambridge: University Press. Robbins, C. (1968). The Eighteenth-Century Commonwealthman. Indianapolis: Liberty Fund.